123SignUp is an online platform for effectively managing of event registrations and memberships and helps streamline performance and automate common membership-related operations. The all-in-one platform focuses on event management and association management. It helps businesses save time by automating most of the time-consuming operations related with membership-based businesses. It allows organizations to focus more on growing memberships instead of spending most of the time in managing them. The event registration and membership management tools allow businesses to automate enrollment, renewal and collections and help them collect online payments and event sign-ups. The online platform also makes it easier to effectively communicate and effortlessly connect with the members. The memberships, financials and donations tracking features provide organizations with all the information they need to stay ahead of the curve and manage relationships and events in a better way. 123SignUp’s Association Manager allows quick and easy management of memberships, saving time spent on administrative tasks. The platform not only works well for corporate businesses, but also suits non-profits and small-medium businesses. The Association Manager provides powerful tools that help automate the whole process of membership management and allows organizations to accept online payments for membership dues, donations, events and more. The platform makes it easier to schedule automated renewal reminders, while allowing integrating different event modules such as enrollment and renewals with the official website. More than 50 on-demand reports help in keeping track of registrations, memberships, donations, financials, surveys and more. 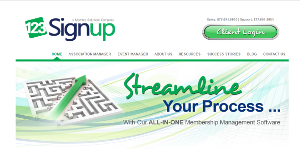 It also allows members to renew their memberships or join an association during the event sign-up process. Promoting events via the social media is also made easier through features, including email marketing, Twitter and Facebook posts. The Event Management software provides a reliable and flexible online platform to manage online event registrations and helps boost attendance and revenues. Events can be setup easily and range from simple events to more advanced multi-session events. The integrated email marketing features allow organizations to easily send announcements, newsletters, reminders and more directly from the system. Automatic confirmations are sent once attendees register or make payments, saving time and providing instant status updates. The software provides registrants with multiple payment options, allowing them to conveniently and securely make online payments. Aiming to add more exclusivity to the registration process, 123 SignUp supports registration by approval, allowing organizations to review applications before granting approval. Accepting donations at the time of registration saves time and reduces administration work, while the software also allows CEU tracking and registrants to print CEU (Continuing Education Units) certificates themselves. Customizable post-event surveys can easily be created and sent to attendees through the platform, while organizations can also schedule them in advance with pre-defined closing dates. If you are interested in 123SignUp it could also be beneficial to analyze other subcategories of Best Business Process Management Software gathered in our base of SaaS software reviews. Enterprises have unique wants and requirements and no software application can be just right in such a scenario. It is useless to try to find a perfect off-the-shelf software app that meets all your business needs. The wise thing to do would be to customize the application for your specific needs, worker skill levels, finances, and other aspects. For these reasons, do not hasten and subscribe to well-publicized leading applications. Though these may be widely used, they may not be the perfect fit for your particular requirements. Do your homework, look into each short-listed system in detail, read a few 123SignUp reviews, contact the seller for clarifications, and finally settle for the app that provides what you require. How Much Does 123SignUp Cost? We realize that when you make a decision to buy Business Process Management Software it’s important not only to see how experts evaluate it in their reviews, but also to find out if the real people and companies that buy it are actually satisfied with the product. That’s why we’ve created our behavior-based Customer Satisfaction Algorithm™ that gathers customer reviews, comments and 123SignUp reviews across a wide range of social media sites. The data is then presented in an easy to digest form showing how many people had positive and negative experience with 123SignUp. With that information at hand you should be equipped to make an informed buying decision that you won’t regret. What are 123SignUp pricing details? What integrations are available for 123SignUp? If you need more information about 123SignUp or you simply have a question let us know what you need and we’ll forward your request directly to the vendor.